In 2011 the University of California laid out plans for a new payroll system called UCPath (for Payroll, Academic Personnel, Timekeeping, and Human Resources). The goal of the $170 million project was to save a reported $100 million per year eventually and to replace a 30-year-old Payroll Personnel System (PPS) that runs separately for each of the 11 UC locations with Oracle’s PeopleSoft payroll and HR systems. All systems were planned to be live by the end of 2014 and run centrally in a new UCPath processing center. In 2014 we described how the project had grown from $170 and 36 months to $220 million and 72 months. In spring of this year we described how the project was planned to cost $504 million and take 93 months (almost five years longer than originally planned). The Office of the President currently projects the implementation cost of UCPath to be $504 million—$334 million over its original estimate of $170 million—and it has delayed the date of UCPath’s implementation by nearly five years, to June 2019. Moreover, the $504 million estimate does not represent the full cost of the project because it includes just a fraction of the cost associated with the campuses’ implementation efforts and a shared services center, known as the UCPath Center. The full cost to the university of adopting UCPath is likely to be at least $942 million. Most of this information was available in the spring, but the state auditor makes a compelling, well-documented argument. What about the current estimate of benefits – is it $30 million per year as Chris described or closer to $100 million per year? One big concern I have is that the information on project benefits was not updated, presented to the regents, or asked by the regents. 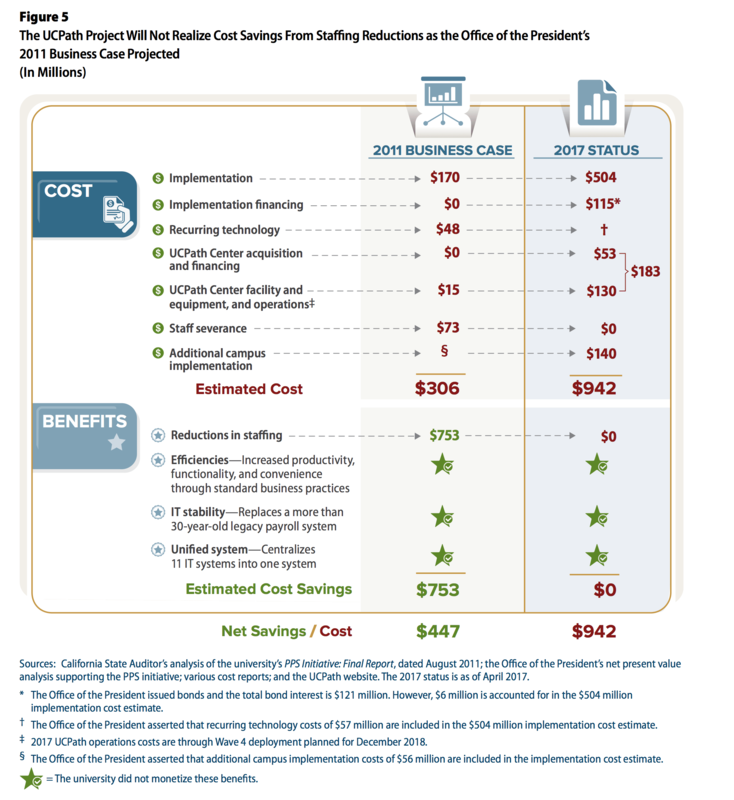 The Office of the President’s initial business case in 2011 asserted that UCPath would result in $753 million in cost savings, primarily from staffing reductions at the campuses. However, the UCPath project director told us that the Office of the President no longer expects to realize those projected savings. Several campuses also reported to us that they do not anticipate the staff reductions that the 2011 business case promised. In fact, in a status update to the University of California Board of Regents (regents) in July 2017, the Office of the President did not discuss any offsetting savings but rather discussed creating efficiencies and avoiding costs. What this means is that the net savings / cost have changed by almost $1.4 billion. Let that sink in. Billion with a 'b'. I have complete confidence in UC’s ability to continue successful implementation of UCPath, a necessary project with significant, expansive, and long-term benefits to the University. There is no serious re-questioning of assumptions or of UC's ability to finish the job, despite plenty of evidence pointing to fundamental problems in the project. The UC response in the UCLA paper is even more problematic, as it mostly argues that the implementation only costs $504 million many other items are operational in nature. The UCPath Center will assume all payroll and human resources functions systemwide, according to the state audit. Doan added the UC believes the $130 million the state audit cited for the center’s operating cost should be included in the project’s operations budget, rather than its implementation budget, because the UC does not typically include operating expenses in project implementation costs. In other words, UCOP is complaining about accounting methods while not disputing the findings. UCOP wants to just look at IT implementation costs, while the state auditor is looking at "the full cost to the university of adopting UCPath". We here at e-Literate are focused more on ed tech - the impact of changes to teaching and learning enabled by technology. So it might help to add some ed tech perspective on this story. Taking the well-grounded assumption that the project, or some form of it, was necessary, and making the assumption that UC's original plan made some sense ($170 million for IT implementation), let's look just at the impact of cost overruns. The fallout from UCPath's cost overruns and loss of planned savings likely exceeds the entire combined instructional technology budget for all 10 UC campuses. This project matters.